25 awesome home remedies for skin care – Instant fairness, anti aging, acne, pimples, dark spots, dark circles under eyes, dry, oily skin, wrinkles & all skin problems related to beauty. Part 2. Fill up your mouth with clean water and wash your face with cool water. This stretches your facial skin & cleans your skin properly. Mix 1 teaspoon of raw honey with 2 tablespoon of tomato or orange juice/pulp, make a thick paste. Apply this paste on your face and wash after 15-20 minutes to get a beautiful smooth & glowing skin. Apply equal amount of lemon juice & sugar & almond (1 tablespoon), make a fine paste. Massage it for 15-20 minutes then apply green gram powder (1 tablespoon) for 15-20 minutes & wash it off with warm water. Don’t use soap to wash your face for at least 6 hours. Make a paste of oats (2 tablespoons) and add 1 tablespoons lime juice and milk in it. Apply on your face and wash after 20 minutes before a bath. 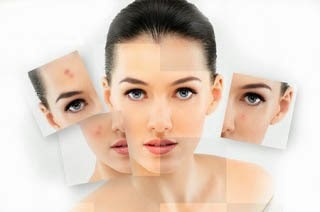 Anti ageing/Preventing wrinkles: Applying pure Castor oil prevents wrinkles and softens the skin. This slows down the ageing process also. For instant glow, grind few almonds along with milk or curd and add olive oil or honey & orange or lemon juice (1 tablespoon) in it. Apply on your face & leave it for 15-20 minutes. And wash your face with cold water then rub your skin with an ice cube gently. Pat dry your skin to get instant glowing look. Make a fine paste of tomato pulp (1 tablespoon), raw potato pulp/juice (1 tablespoon) & honey (1 teaspoon). Apply this paste on your face, neck & on your hands, elbow for 20 minutes. Before washing this massage for 5 minutes, then wash it off. It will give you the best result for glowing & healthy skin. Boil 3 medium size bowls of chopped cabbage in 4-5 glass of water for 10 minutes or boil in pressure cooker. Wash your face with this warm cabbage water regularly. Apply 1 tablespoon of buttermilk on your face for 15 minutes, it will soak up unwanted oil from your skin without drying it. Then wash off with warm water. It is very useful for anti aging, wrinkles free soft skin. Take fresh slice of tomato/orange/cucumber/papaya & massage/rub the slice gently on your face & neck. It’s very helpful to hydrate skin. Make a paste of gram powder/besan (1 tablespoon), turmeric powder (1 teaspoon), pinch of salt, and milk or curd & lemon juice (1 tablespoon). Apply the paste for 20 minutes & then wash it off. Do it at least 2-4 days a week. You’ll surely see miracle on your face. Mix lemon/orange juice (1 tablespoon) with honey (1 teaspoon) and apply this with light rubbing at least for 5 minutes on neck & face and leave it for 10 minutes. Use this mixture once in a day on regular basis in place of your face wash.
Take 2 tablespoon Besan, 1 tablespoon malai, turmeric (1 teaspoon) & 1 tablespoon lemon juice, mix them well & apply on skin. For oily skin, use raw milk instead of milk cream/malai & 1 tablespoon of lemon juice, apply this pack 3-4 times a week for 20 minutes and then wash off with normal water. Add 1 tablespoon of fresh lemon juice and 1-2 tablespoon of curd to a cup of warm or normal water water and massage for 10 minutes in upward and circular direction. Massage gently. Do this once a day.